When pop music stars find themselves establishing relatively long careers (’10 years and I still have a record contract!’) they have to make decisions about how they’ll continue their time in the spotlight. Some fight tooth and nail to maintain their relevancy – working hard to remain on top of the charts and in the hearts and minds of young music fans by any means necessary. And then there are the musicians who – decade after decade – keep their foothold in the zeitgeist without any air of desperation. They’re cool, not pandering. They create music for themselves and it’s up to us whether we decide to come along for the ride. 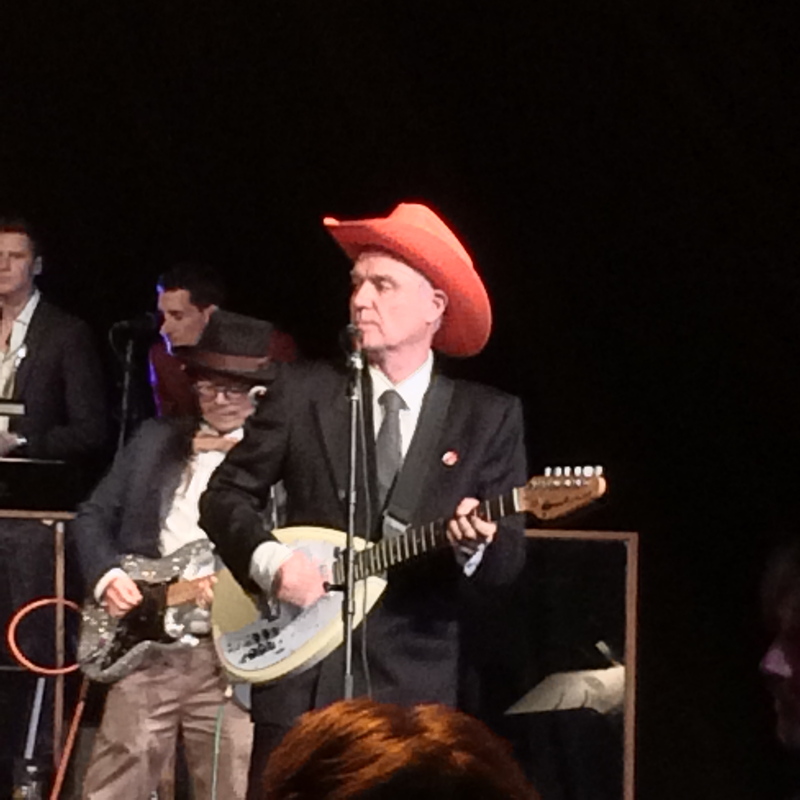 David Byrne is decidedly in the latter category – a fact confirmed for me by his performance at the William Onyeabor tribute this past weekend at BAM. David Byrne shared the stage with more than a dozen other musicians but all eyes in the mostly 20/30-something crowd seemed fixed on him. I know I was focused on him – happy to have a chance to see him perform live, yet again. Comparing Byrne’s performances in Stop Making Sense and at BAM reveal to me 1) his remarkable consistency in style and interests 2) how he is just as entertaining but has grown even more fascinating over the past 30 years. See what I mean? I love the idea that all of the people in the audience thought they were going to a rock show – but instead Reverend Byrne took them to CHURCH! Is this the sound of secular gospel music channeled through RISD and CBGB? Is this the moment when the New Testament of world music begins to replace the Old Testament of rock and roll? Is the pastor in the big suit possessed by the holy spirit? Is he Speaking in Tongues? Ok – so I’m no Jonathan Demme, but I hope this clip conveys both the joy the audience and Byrne is experiencing. In Stop Making Sense – I feel like I’m watching DAVID BYRNE – a persona created for the concert. It’s an ecstatic performance but I have no idea what’s going on under the slicked back hair and the big suit? Is he enjoying himself? Does he like his bandmates? What does he think of the audience? All of that mystery is intriguing but 30 years of it would have probably grown tiresome. Today – I think we get a pretty good glimpse of the actual man. Look at him – he’s SMILING. He seems sincerely happy to be on this stage, performing music he loves, to a crowd of 2,000 fans. Over the years, Byrne (like David Bowie and Annie Lennox) – dropped the character. He’s less overtly odd – but has become more interesting. He’s openly pursued his musical passions and followed his creative impulses. I’m sure the ego is there and he wants to succeed, but I think the music comes first. If only other artists from the 80’s felt the same way. 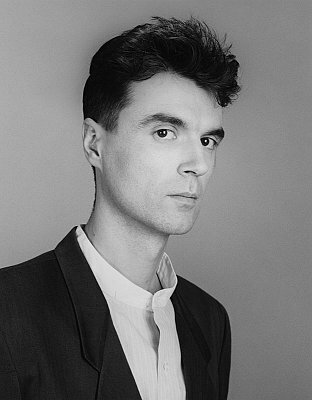 David Byrne collaborating with St. Vincent seems inspired. Madonna performing with Miley Cyrus seems really sad. I haven’t followed all of Byrne’s efforts over the past 3 decades but it’s a pleasure to know that even when the masses may not be paying attention – he continues creating, innovating, writing – and doing what he does best – being David Byrne. This entry was posted in Concerts, Tribute and tagged 1980s, 1984, Concert Films, David Byrne, Jonathan Demme, Music, Pop Music, Stop Making Sense, Talking Heads, William Onyeabor, zero to hero, zerotohero on May 6, 2014 by Sean. Yes, David Byrne is up there with those gifted individuals like Bowie who do their own thing and just shrug their shoulders if the public don’t get it. Good post.